I sometimes have trouble getting started drawing... AND SOMETIMES I CAN'T STOP! 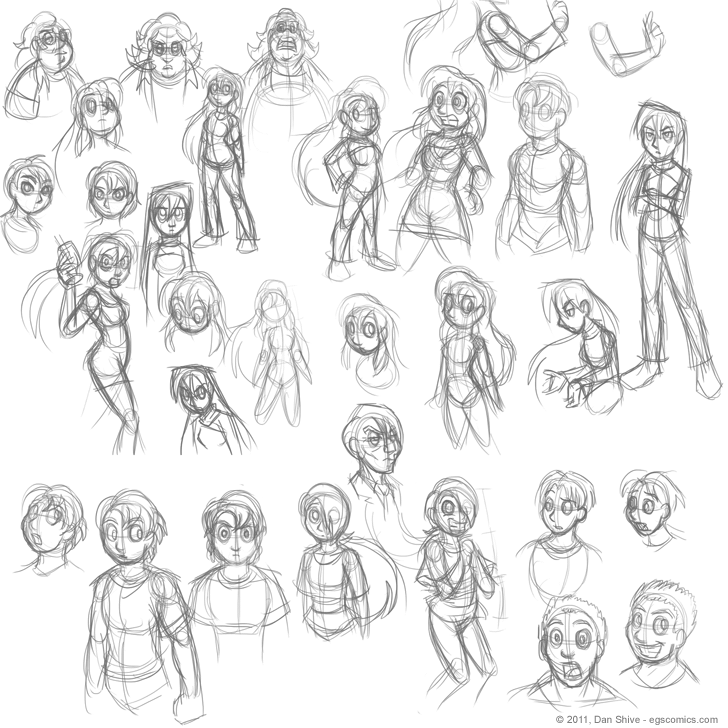 I started sketching these late Saturday night, and only stopped because I forced myself to get some sleep. I sketched these in Photoshop, and I don't know how big the canvas was when I started, but I increased the canvas size at least twice so I could keep going. Part of the reason for this sketch fest is that it's been my goal for years (pre-dating EGS) to figure out a structural manner of drawing that I'm comfortable with, which is to say I've been wanting to get a solid feel for using basic shapes as the foundation of my drawings and be consistent with them. Drawing in a consistent, simple fashion is harder than it looks. In fact, even if the results are simple, the construction can get ridiculously complicated as far as on-model character design is concerned. The best example I can think of is the Simpsons, as they have a book that shows how many rules there are for making those characters look right. The rules of thumb for Homer's face alone are shockingly complex. I acquired that book a while ago, but haven't played around with drawing those characters much at all, yet... I need to change that. While it's important to develop one's own style, one can learn a LOT by trying to emulate someone else's style. As such, my drawing a gun-wielding pony in the post-apocalypse was a learning experience (as opposed to utter madness).